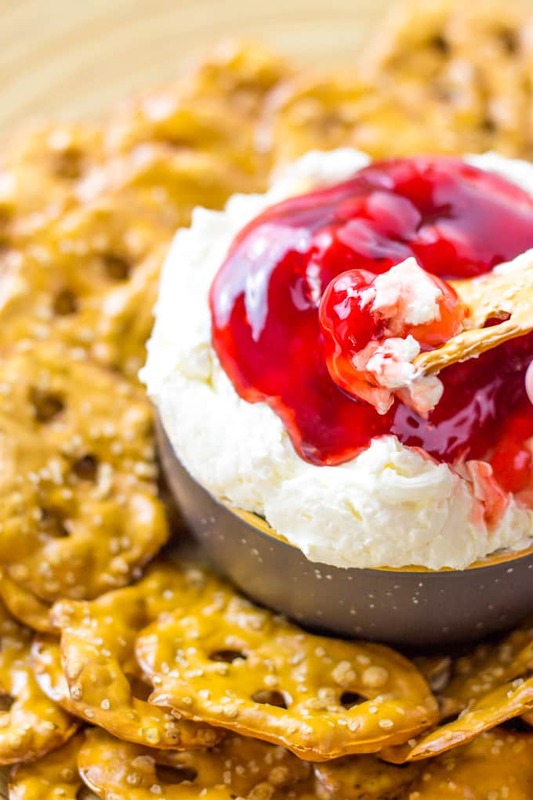 I make Cherry Pretzel Salad Dip when I am craving something cherry and a little less time-consuming than a traditional Strawberry Pretzel Salad. It is totally Dippable and Inhalable! Pretzel salad is a frequent dish at potlucks, pitch-ins, or whatever you call the get-togethers where everyone brings a dish. My strawberry pretzel salad stacks are a remake of the traditional dish consisting of three layers: pretzel crust, cream cheese-whipped cream-powdered sugar, and a fruit jello topping. An easier, quicker, and less messy way of enjoying this salad is my Cherry Pretzel Salad Dip. Dips are some of my favorite things because they are versatile, small portioned, and can be made ahead of time so you can be prepared when you need them! But just as much as I love savory dips like salsa and hummus, a dessert dip makes me swoon. The thing that makes this dip so special is the vehicle that gets it into your mouth: the salted pretzels. Even better than that, they are thin and the saltiness balances so well with all the sweet ingredients of the dip. You can’t forget that the pretzels add a bit of texture too. Forget that cherry pie is my all-time favorite dessert, combine it with a creamy dip and I am in heaven! This got me thinking that I can make the traditional strawberry pretzel salad with cherries instead:) Cherry pie filling is something that you can grab while at the store too if you don’t feel like making your own. Homemade is best, but my time is valuable too. Now the traditional pretzel salad, be it strawberry or cherry, is made in layers. When I hear the word layers I immediately think “how much time is this going to take?” I don’t have time to make a dessert that takes 3 days. Who does? I am craving something now! After you combine the pretzels, sugar, and butter you bake it until crispy. Then you have to mix the cream cheese, powdered sugar, and whipped topping, spread it on the baked pretzel crust, and then prepare the jello. This is already too many steps and my craving is getting worse. Now we are waiting for the jello to dissolve and then chill a bit before you can pour it over the cream cheese layer. Then you have to wait even more time while you stick the layered salad in the refrigerator and wait for the jello to set up. Then and only then can you take it out, slice it, and enjoy. I was craving it three days ago. 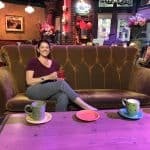 By now, I have already moved on and found something else. 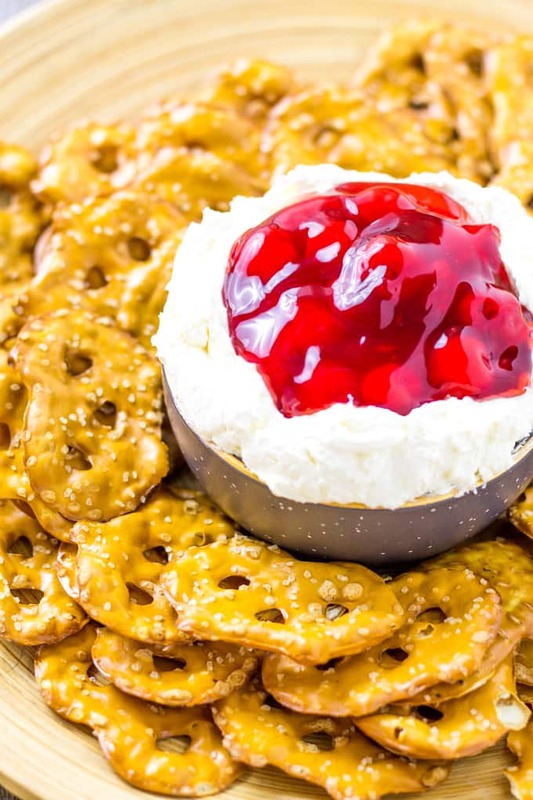 Cherry Pretzel Salad Dip is better than the original pretzel salad! I guarantee it isn’t as good as this dip that takes less than 5 minutes to whip up before you are enjoying it. No waiting! 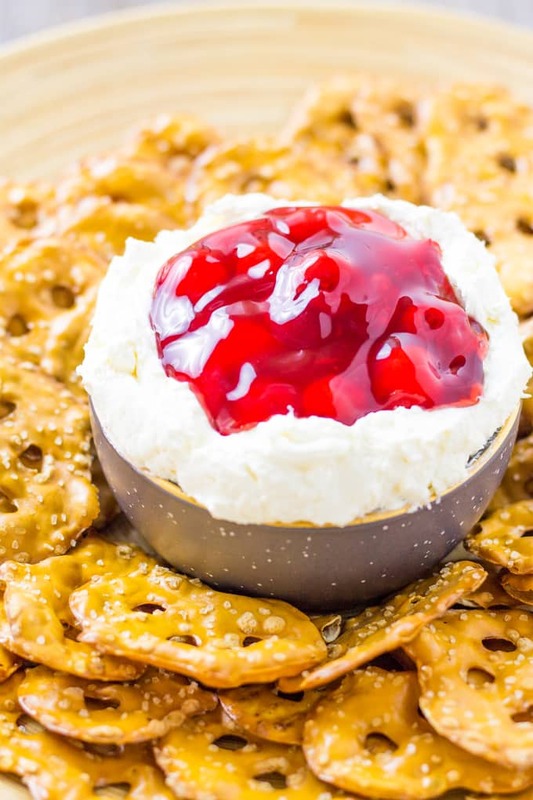 The Cherry Pretzel Salad Dip has all the same ingredients as the original salad but in a dip form. The same cream cheese, sugar, and whipped topping are the base of the dip. 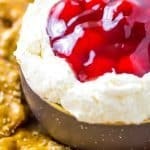 A topping of cherry pie filling gives you the flavors of the jello layer without all the boiling, chilling, and waiting. To get that buttery, salty, and crispy crust layer I use salted pretzel crisps to scoop all the tart and creamy goodness into my mouth with reckless abandon. Less than 5 minutes and you are enjoying it! Once you get it all combined I know you will dive in like me. Diving mask not required. 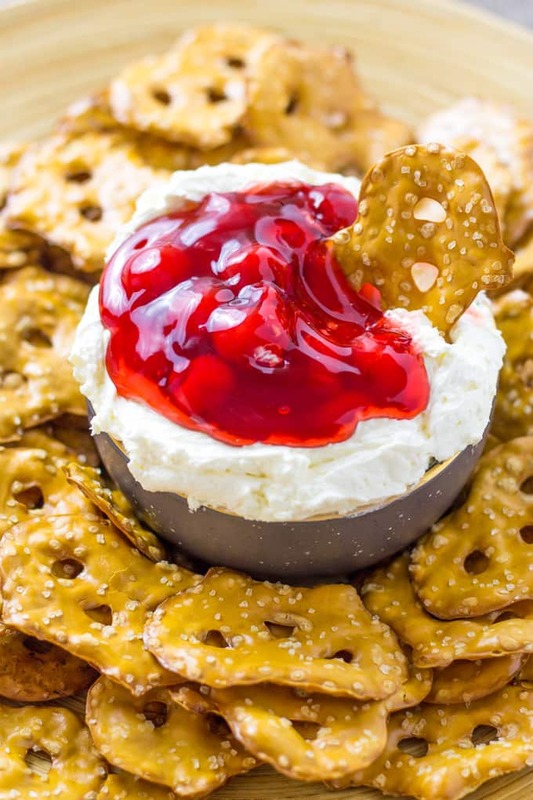 I make Cherry Pretzel Salad Dip when I am craving something cherry and a little less time-consuming than Strawberry Pretzel Salad which is a Southern staple. Dippable and Inhalable! In a bowl, combine the cream cheese, sugar, and salt. Whip with stand or hand mixer until fluffy. When ready to serve, place cream cheese mixture into a serving bowl. Top the dip with the cherry pie filling. I’ll have to make this for book club! That looks so yummy, what a great easy appetizer! This dip would disappear in a quick minute in my house! Looks great! I am really loving all of the dip recipes you’ve been sharing. I can’t wait to use this over the holiday! I love pretzel salad! I never did with cherries before…. This a great idea! I love it!!!!!!!! I completely agree, waiting three days? Nope, moving on definitely! Love your updated recipe. This sounds just delicious and perfect for a get-together! What a yummy recipe! This looks crazy good! I can’t wait to try it! Oh my!! Love this as a salad — SUPER LOVE it as a dip! This dip looks so addicting! I just love dessert dips! Those are my favorite pretzels! Now, I have to try this dip to have with them. Yum! 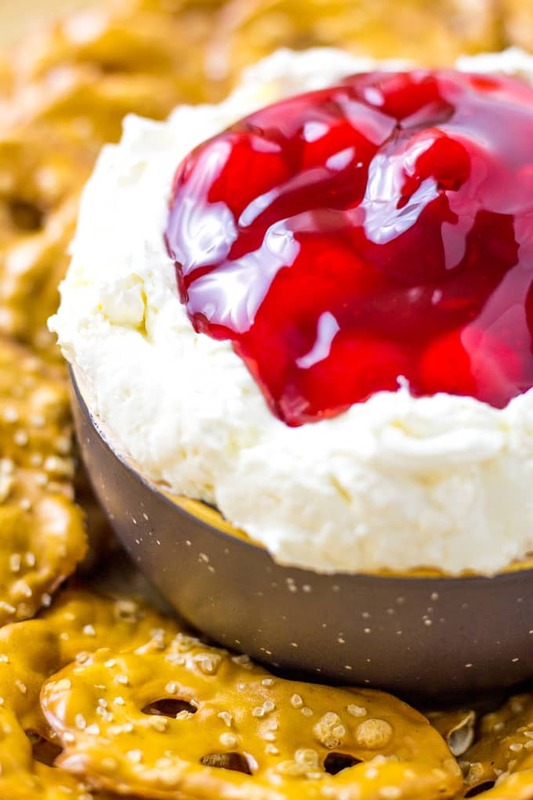 This update to the traditional pretzel salad is so clever! I’m agree that the layering making a crust and all takes planning and patience. This way I can enjoy now! I just bought sugar free cherry topping, yay! I’m loving the versatility and ease of this yummy pretzel dip. I’m already fantasizing about putting a fall them on it with some apples, cranberries, or hazelnuts. Fantastic recipe here!